The Center for Surf Research at San Diego State University is conducting research into the surfing communities attitudes and behaviors relating to surfing, travel, sustainability, technology, and of course surf parks. 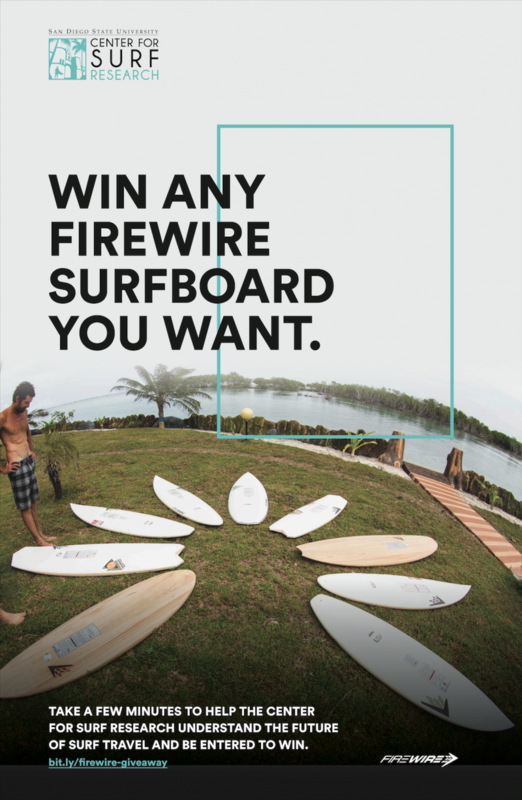 In order to encourage participation, those that complete the survey are entered into a draw to win a Firewire Surfboard of their choice. Firewire has been in the surf park news recently with their partnership with Surf Snowdonia, likely to be the first full size next-generation surf park ever built and scheduled to open in August this year. “We’re really excited to be researching in the surf park space“, said Ponting. The Center for Surf Research has been in contact with Surf Snowdonia and has plans to conduct research – and try out the wave – onsite in October. The Center for Surf Research is a non-profit research and teaching center housed in San Diego State University’s Sustainable Tourism Program under the L. Robert Payne School of Hospitality and Tourism Management.The preeminent resource for sustainable surf tourism researchers, tourism operators, communities, governments, and surfers globally. By incorporating principles of sustainable tourism, surf tourism promotes healthy lifestyles and is a key driver for the environmental, social/cultural, and economic well being of destinations.